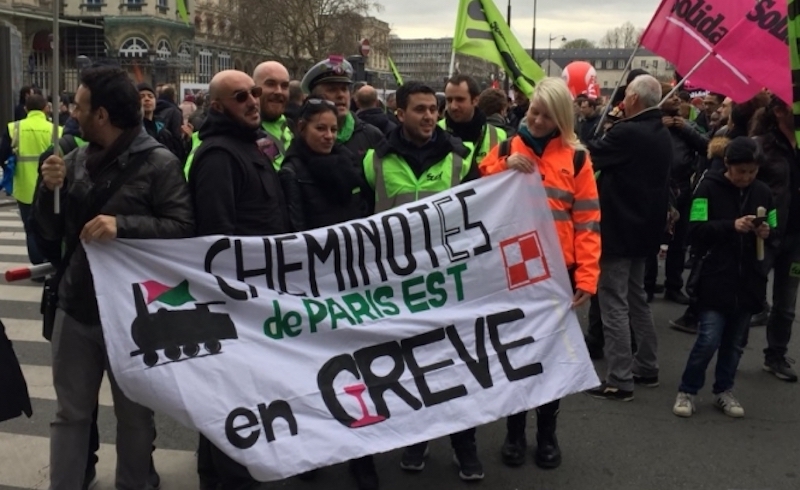 Railworkers engaged in the rolling strike action in the area to the north of Paris asked Antonio Negri to answer a few questions connected with the current struggle against the rail reform and the meaning of solidarity. First published at Révolution Permanente. Translated by David Broder. In Italy they sometimes call him a cattivo maestro [literally, "wicked teacher"]. Antonio Negri is an emblematic figure of Italy’s operaista tradition and extra-parliamentary Left. We could translate this epithet as "bad example" or even "bad seed." Doubtless that was the reason why, amidst their fight against the reform of the French railways, the striking railworkers in Paris Nord wanted to ask the philosopher for his insight. Anasse, a pointsman in Le Bourget: How can an intellectual today show solidarity with a strike action by workers? Why do I support your struggle "today," in this very moment? I would also have supported it yesterday. But I get the impression that today the bosses and the president find this struggle particularly troubling. Why is that? First of all, because it shows that not only the bosses are able to wage the class struggle. The reality is that the workers’ class struggle is decisive in determining the foundations of social relations and of the development of society. That is why the struggle is able to bring together all the exploited. There is no paradox in the fact that the railworkers’ working-class struggle (and we might say, it is difficult to find anything more "working-class") is becoming an emblematic moment of the whole precariat’s class struggle, including the one waged by the students. Secondly, because this fight, which we all want to see turn into a "social strike" — and in fact, this is the condition of its success — is confronting privatisation. Privatisation is a fundamental instrument of the neoliberal system of governance and the shift in wealth distribution in favour of finance capital. Thirdly, because Macron has made this struggle a symbol of his sovereignty over all classes. For him, winning this battle would mean wiping out any possibility of class struggle and of the formation of a class-based political opposition over the years to come. That is what Thatcher did with the miners in Britain and Reagan did with the air-traffic controllers. But that was a different era. Today, neoliberalism is in crisis. And you [railworkers] are giving a powerful demonstration of that fact. Karim, Landy maintenance centre: It is said that our status is a privilege dating back to a time that has now passed. In your view, what, today, is a right and what is a privilege? A privilege is a property, a status, a condition that excludes others. Your status does not exclude anyone. You did not fight for it and win it because you wanted to exclude anyone else. Quite the contrary: you want all workers to be able to enjoy this status, and with your struggle you are fighting in that direction. A privilege, in contrast, is the status of the rich, the very rich, the ones whose ISF ["Solidarity Tax on Wealth"] Macron abolished. A privilege is something exclusive: it is something that denies citizens a less unequal distribution of wealth, and the rights that could flow from that. That being said, the attack against the railworkers’ status is obviously just a pretext to ram through the privatisation of the SNCF [national rail network], and to impose the neoliberal social order on sectors of the workforce who had thus far resisted this. But there is also an ulterior ideological motive behind the attempt to strip the railworkers of their status: for this status was, and remains, a collective conquest. And that is what the bosses are fighting against. They are prepared to concede individual privileges, but they reject any "common" conquest. We need only look at what happened at the ZAD [occupied former airport site; "Area to be Defended"] in Notre-Dame-des-Landes. After having expelled the occupants-occupiers they allowed them to return one-by-one, on condition that they agreed to sign up to individual contracts. They were totally barred from making joint, common proposals. The battle against your status is a symbolic battle, being waged under the banner of individualism. Laura, a pointswoman in Le Bourget: The strike could get tougher over time. They are talking about us as if we were taking people hostage. What do you think about this? Those who accuse you of "taking society hostage" forget that the society in which we live is a classist society — which is to say, a society shaped by the class struggle. It is rather comical to see the bosses whinging about a workers’ struggle "taking them hostage." For they are fighting the class struggle every day. As if the boss wasn’t taking the workforce hostage, when he says "either work for the wage that I’ve decided, or else I’ll chuck you out and doom you to poverty." But beyond this comical aspect of the situation, we should also recognise that this kind of statement also expresses a certain fear among the bosses themselves. That is particularly true of those who experienced the strike wave in 1995, like [current prime minister] Edouard Philippe, who was [1995-97 prime minister] Alain Juppé’s spokesman back then! They cannot bear the thought of the different struggles coming together, particularly if they come together in a lasting way. They fear the building of a real workers’ political movement, especially in a moment in which social democracy is dying. At the end of the extraordinary struggles in 1995, that was precisely the missing element. But the need to head in that direction was already making itself felt. Back then I interviewed Bernard Thibault [at that time, leader of the railworkers’ section of the CGT union], who told me "Either the left-wing parties will prove themselves capable of real renewal, and quickly, to get up to speed with the strike movement, or else this movement will provide unprecedented political responses of its own." That was not how it turned out. Are we still OK with being taken hostage by these defeats? In this same interview, Thibault added that "The workers will themselves have to take charge of the political dimension of the struggle. And that means the workers taking back control of politics for themselves." That provides a guideline for today, so that we really can hold the bosses hostage to our struggles.